What can the UN do, if anything, to preserve peace and security on an international scale, in the light of the so-called ‘war on terror’? Can this be done in a way which complements, or corrects America’s role as international policeman? 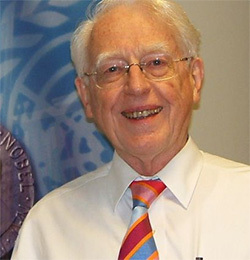 As a former Assistant Secretary General of the UN, Sir Richard Jolly will discuss “What role remains for the UN in preserving peace and security, and furthering development?” He was Deputy Executive Director in UNICEF overseeing their programmes in 130 countries and pioneering UNICEF’s work on debt reduction. From 1996-2000 he co-authored the widely acclaimed Human Development Report. He has produced numerous publications including “Development and Adjustment with a Human Face.” And at City University, New York, he is co-director of a history of the UN’s contribution to economic and social development.